I belong to INCO, the International Community Association of Agios Nikolaos and the wider Lassithi Region, a Not For Profit Organisation providing the legal framework to support social, cultural, charitable and community activities. On 1st/2nd September I joined a group of fourteen INCO members for a weekend in Patsos, in the centre of the Rethymno prefecture, Crete. Our host was Vasilis of the Patsos Taverna, an ex paratrooper who is passionate about local Patsos history and environment. Vasilis ensured we all had accommodation in Patsos, provided wonderful food courtesy of his mama, Mrs Maria, and guided us for local excursions. Prior to the trip I re-read Ill Met By Moonlight, by W Stanley Moss, about a hazardous war-time mission in Nazi-occupied Crete. A young British officer, Major Patrick Leigh Fermor, led the kidnap of General Kreipe, Commander of the Sevastopool Division, and narrowly escaped a German manhunt, to get the prisoner off the island – a major coup for British intelligence. The reason behind my reading was our visit to the hideout where heroic Patsos folk kept the group fed and hidden for two days despite pressure from Nazis. The photo of our guide, Vasilis (above) shows him sitting in exactly the same spot as a photo of General Kriepe taken by W Stanley Moss and included in his book. A plaque on the cliff wall commemorates the event. Somehow the single red poppy left by the family of an AnZac soldier was more poignant. During the early evening we explored the village before meeting up to chat the evening away…would you believe it, the evening ended with me as the raki waitress!! The ruined church in Patsos has the remains of wonderful icons. They have been removed for restoration and will be returned to the village in due course. The small olive tree was recently planted as a memorial to the wartime efforts of Patsos villagers who maintained essential secrecy. The next morning we visited a church dedicated to Saint Anthony nestling in the rock face. This church is reached by an easy path at the top of Patsos Gorge – then the hiking trail starts. After a photo call on the bridge we enjoyed a downhill walk at a pace that allowed everyone time to enjoy the beauty of the rock formations, cliffs, river bed with a still tinkling stream and wonderful trees. After about 1.5 k we had a breather and then walked back up to the church. In theory we could have carried on walking until the gorge bottomed out at a reservoir. Instead we drove near to the reservoir to walk along a gentle path next to bubbling springs. The time and energy saved by the drive provided opportunity to visit a new local enterprise, a winery in its second year. Yep, you’ve guessed it, not only did we follow the grapes journey from delivery to wine bottle we had a wine tasting lesson too. At present they make white and rose wine – mm, hard to choose, so I bought both. Ooops, we spent rather too long over our wine tasting and Vasilis had a phone call from his mama asking where we were as lunch was waiting – the tastiest stuffed tomatoes ever. Also on the menu was a fab aubergine dip we’d enjoyed the previous day. Thankfully, Mrs Maria was not one of those cooks who keeps her recipes secret – I’ve made some since getting back to Kritsa. After a very leisurely lunch some of the group stayed over for another night in Patsos, some headed home and others headed off to holiday in other parts of Crete. I shall certainly return to Patsos as I’d like to walk more of the gorge, and in a year’s time the winery will start selling red wine too, and I need to taste that for completeness. If you spend time in East Crete and would like to learn more about INCO, you can use the contact form below. Prick aubergines all over and place in hot oven for 45 mins – turn over halfway through. Let aubergines cool, then cut in half and scoop flesh into a food processor. Blend in 10 second bursts until there is a smooth paste – Tip, put a large handful of parsley leaves in with the final burst and then there is no need to chop it. Add mayonnaise, olive oil and vinegar and stir briskly. Cover the dish of dip with cling film and let it rest in fridge overnight. Sounds lovely. The walk and the meal. 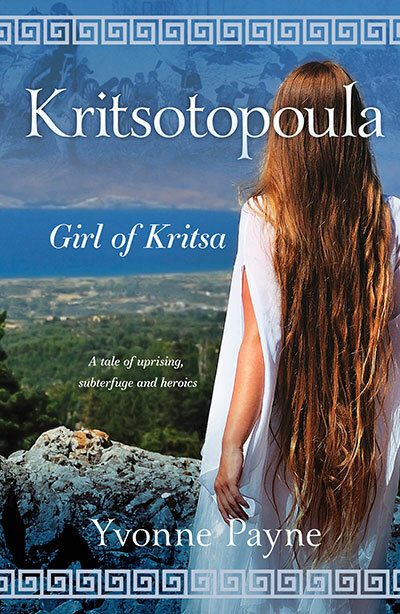 Living a dual life between the UK and Kritsa, a village in Crete that provided the inspiration for my historical novel Kritsotopoula, Girl of Kritsa. Happy to share knowledge and experience about living in East Crete, I'll answer your questions and/or guest blog.